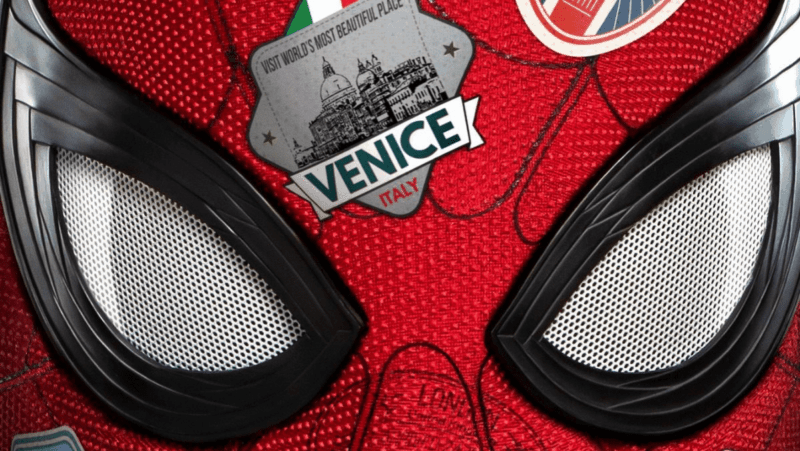 The first trailer for SPIDER-MAN: FAR FROM HOME is here! There’s so much cool stuff to go over, with everything from elemental monsters, Peter traveling to Europe, or the new villain (hero?) Mysterio. 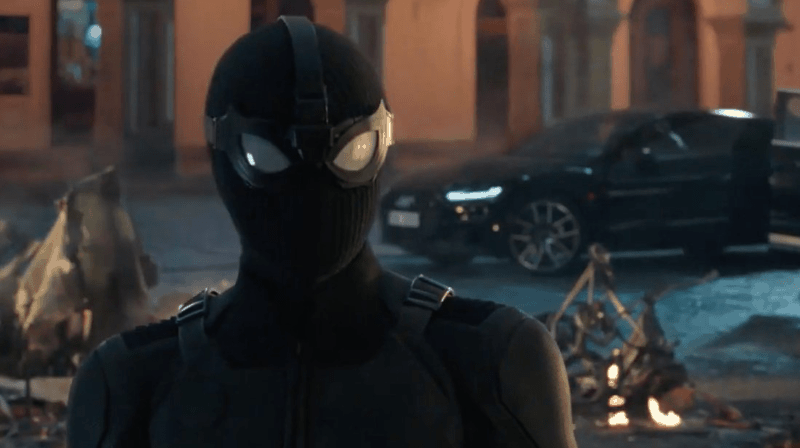 However, the FAR FROM HOME trailer also shows Peter Parker meeting Nick Fury for the first time! Here’s a look at their relationship in the comics, and where we might see it go in the upcoming film. At the start of the FAR FROM HOME trailer, Peter is very much alive. While there aren’t any spoilers for AVENGERS: ENDGAME, we now know that somehow, Peter will survive his non-existence by Thanos’ Infinity Gauntlet. Apparently, the public loves him. His Aunt May, who discovered his identity as Spider-Man in HOMECOMING, seems fine with his wall-crawling adventures. We see Peter getting his passport and packing. He’s going on a trip to Europe with Ned, MJ, and the rest of his friends. Leaving his spider suit behind, Peter just wants to spend time with his friends and have a good time. He says that Europe doesn’t need a friendly neighborhood Spider-Man. In Europe, we see Peter flirting with MJ, and he thinks he might actually have a shot with her. As he walks into his room with Ned, Ned is shot with a tranquilizer. The shooter is none other than Nick Fury, the former director of SHIELD. It looks as though he survived non-existence as well. He says it’s nice to finally meet Spider-Man. He tells Peter to put some clothes on and that they’re going for a ride. Peter worries that Nick has just hijacked his summer vacation. We see several elemental monsters attacking the city, supposedly the threat that Nick needs Spider-Man’s help with. Nick tells Peter that he has gifts and that they have a job to do. He asks Peter if he’s going to step up. We also see Peter in a brand new red and black suit, as well as a black stealth suit. These are probably courtesy of Fury. That’s all we get from Fury in this first FAR FROM HOME trailer. The rest is some incredible action scenes featuring more of the elemental monsters, supposedly new takes on characters like Sandman, Hydroman, and the Molten Man. We also get our first look at Mysterio, fighting Hydroman. 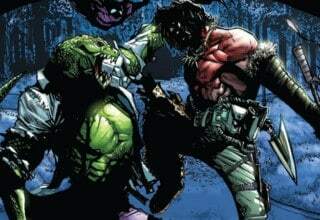 Fury and Parker working together in FAR FROM HOME seems like it’s the start of a really cool dynamic that’s straight from the Ultimate Marvel Comics Universe. 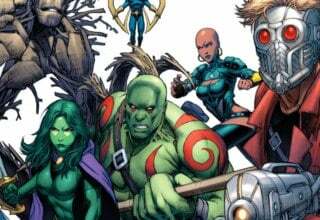 The Ultimate Universe was created by Marvel back in the early 200o’s as a separate and new universe. 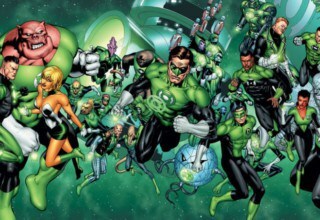 Writers gave characters fresh, new, and different origins than fans were used to in the original universe. The Ultimate Universe is intended to be a much more grounded take on the Marvel heroes. 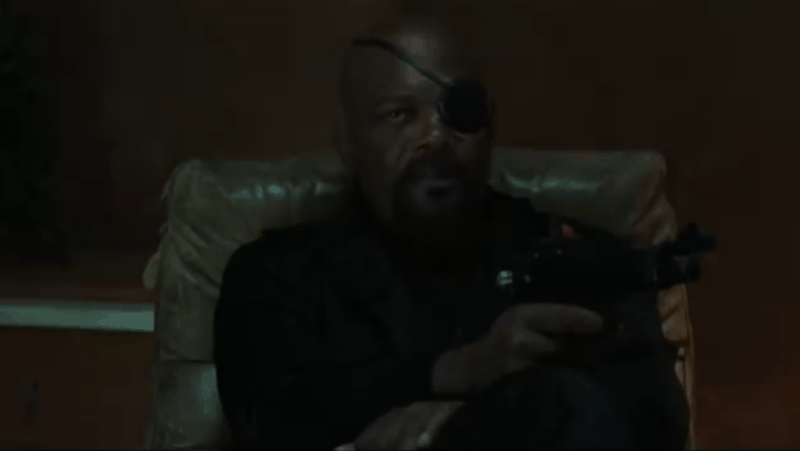 Nick Fury, in particular, serves as a nexus to the Ultimate Universe, having his hands in almost all of the different Ultimate series, much like Fury does now in the MCU. In fact, Ultimate Nick Fury’s character design was based on actor Samuel L. Jackson himself, years before IRON MAN came out. Ultimate Comics is the reason that Samuel L. Jackson got the role. There are more than a few characters and moments in the MCU that take their inspirations from the Ultimate Universe as well. It looks like we’ll be getting another in the form of this new relationship between Peter and Nick. In the Ultimate Universe, Peter Parker is only 15, trying to be responsible with his powers, and do what he can to keep his neighborhood safe. However, he’s still young and makes mistakes, all while juggling his dual identities. It’s hard to fight Doc Ock and minimize property damage when you’ve got homework and girlfriend drama all at the same time. 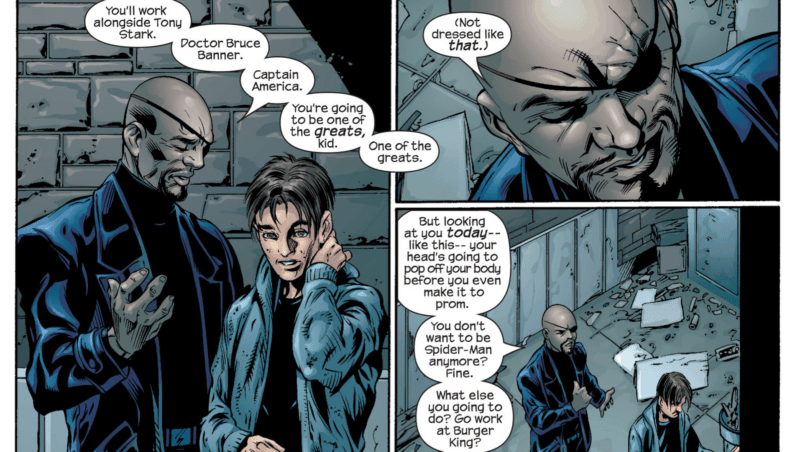 After one too many public blunders, Nick Fury approaches Peter. He tells him that he’ll be watching him. He also shares that once Peter becomes 18, he’ll legally be the property of SHIELD, due to his meta-human status. Thus begins their relationship, where Fury attempts to mentor and groom Peter to one day join the Ultimates, the Ultimate version of the Avengers. Sometimes their relationship gets strained where Peter’s optimistic youth clashes with Fury’s cynical view of the world that comes from being the leader of the country’s top espionage organization. 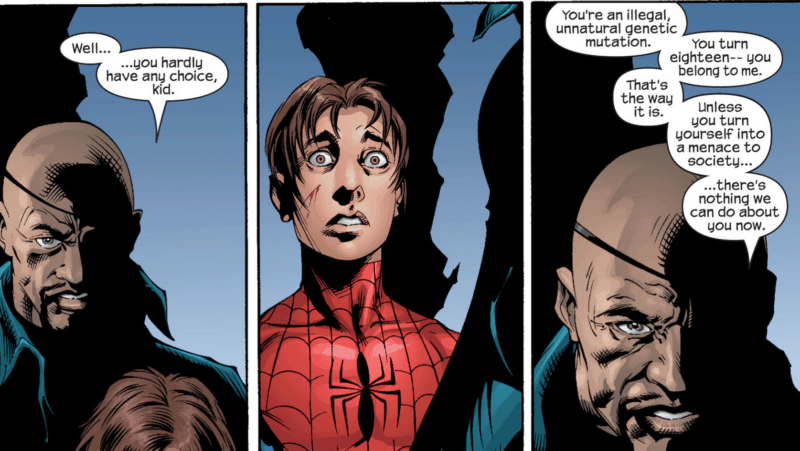 However, at the end of the day, Ultimate Spider-Man looks up to Fury like a father. Sadly, Peter Parker dies in the Ultimate Universe. While the Ultimates were busy fighting on the Brooklyn Bridge, Norman Osborn, the Green Goblin escapes from the Triskelion with other villains who hate Spider-Man. They go after Peter and he stops them all. This was even after he takes a bullet meant for Captain America. He defeated the Green Goblin with the last of his strength and then died. This paves the way for the new Spider-Man, Miles Morales, and Fury allows him to operate in the same way that Peter did. It looks to be like MCU Peter and Fury will have a similar relationship in FAR FROM HOME. I would love seeing them have the same sort of idealistic conflicts while learning from one another as well. 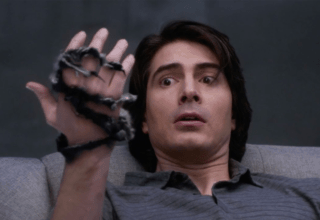 FAR FROM HOME: Doesn’t Peter Already Have A Mentor? Moving into a more speculative zone, why would Fury feel the need to take Peter under his wing and seek out his help? 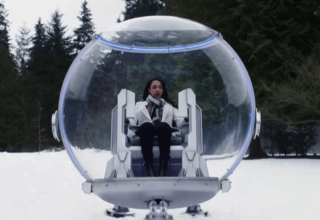 Isn’t there someone else who’s already in the mentorship/surrogate father role? I’m talking of course, about Tony Stark. In the MCU, Stark is critical in making Peter into the hero he is now. Making him his suits, recruiting him in CIVIL WAR, guiding/mentoring in HOMECOMING, and making him an Avenger in INFINITY WAR. He’s been there for pretty much all of the big Spider-Man moments in the MCU. So where is he now? He might not be around anymore. The FAR FROM HOME trailer did a great job of not spoiling anything for AVENGERS: ENDGAME aside from Peter and Nick still being among the living. We don’t know how they’re alive or what transpired to bring them back. 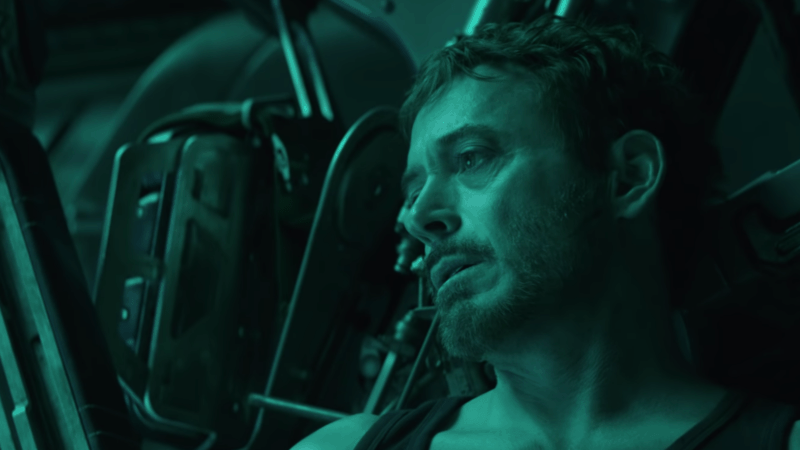 Having said that, it very well could be that Tony Stark does not survive the events of ENDGAME. I mean, he’s in pretty bad shape in the trailer. It could be that he didn’t make it. Fury Filling A Space Left From ENDGAME? This could be an interesting motive for Fury to approach Peter. Since SHIELD went under in WINTER SOLDIER, it’s kinda been unclear as to what Fury’s role is. We do know he has contacts, such as Maria Hill, and that he still has resources to assist when needed, such as bringing in a Helicarrier in AGE OF ULTRON. He also calls Captain Marvel for help at the end of INFINITY WAR and it seems as though he and Hill were going to attempt some sort of organized response before turning to dust. Perhaps Fury looks for where there are holes that need filling in the world, and he goes to work on solutions. 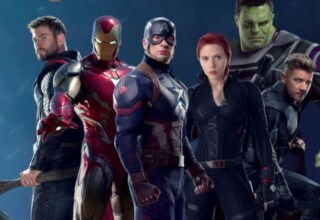 Perhaps one or more heroes are no longer able to protect the world after ENDGAME. Fury sees an opportunity to stop a current threat, the elemental monsters, with Spider-Man. This then gives Fury the ability to mentor and groom Peter to be that next protector, filling the space potentially left by others. It’s two birds, one stone kind of idea that totally fits for Fury’s character. We’ll have to see when the movie releases. Who knows? Maybe Stark’s alive and he’s not in this trailer so as to not spoil ENDGAME any further. At any rate, the relationship between Fury and Peter is one we haven’t yet seen in the MCU, and if it’s anything like their comics’ relationship, it’s going to be great! Do you have any theories, let us know in the comments below!